A Look Back at the Silver Age of comics and how it shaped the concept of the superhero as we know it, in particular how you can include these concepts in your game. Heroes! Learn how to create M&M heroes with the kind of style and power of characters in the Silver Age, assisted by ready-made hero archetypes and character design advice. Villains! Design dastardly villains from cosmic world-beaters to comedic criminals to challenge your players. 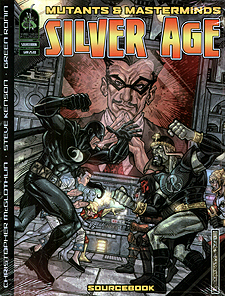 Use the villain archetypes for immediate foes and Gamemaster advice on building Silver Age style bad guys, including nigh-omnipotent adversaries. The Silver Age of Freedom! Travel back to the Silver Age of the Freedom City setting, during the height of the fabled Centurion's career and the founding of the Freedom League! Meet the original Aton Family and the Raven, dark avenger of the night, and read tales of their triumphs and tragedies in a bygone era that inspires the heroes of Freedom to this day! Silver Age rounds out the excitement of the Golden Age and Iron Age sourcebooks, giving you a full range of eras for superheroic adventure.